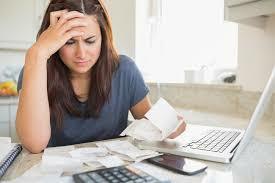 Single mom finances when do you declare bankruptcy? I’ve been a good citizen all these years. I’ve tried so very hard to stay on top of bills while raising children. One day, after years of trying to pay down debt, I hit a point of “I give up”. In the beginning, like everyone else, I had a credit card or two, with low limits, such as $2,500. Over the past ten to fifteen years of having these cards and paying faithfully, including paying them off, I saw that the limits kept increasing. And increasing a lot! I never asked for these increases, and planned not to use them, but in the end I did. I did manage to pay off two smaller credit cards – yippee! But still had these large ones to deal with. So at this pivotal time I was collecting unemployment benefits, and luckily I could still pay all my bills plus my student loan, plus the minimum payments on the last two credit debts. Then I notice on my bill that my minimum payment had doubled, what the hell? So I call them and they said that because I had been late with a payment, there is a clause that states that they can take away the lower interest rate and apply a higher one, in this case, it doubled. The problem now is, I had just barely enough money, literally, and now I cannot pay this. I have juggled and scrimped and even eliminated things like cablevision. I have sat with my bills and calculator like the image below, and I simply cannot. pay. my. bills. juggling, scrimping, eliminating, interest rates! Just trying to pay the bills. I decide to declare bankruptcy. I had considered it for about a year, kept being hopeful, but now it is showtime. I apply with the government registered bankruptcy trustee and get the paperwork started. They were very helpful and not judgemental at all. Fact is, they have seen banks and financial agencies keep upping and upping peoples limits, increase interest rates, and watch while their customers struggle to keep up with their bills. Not nice. and they charge $100 – $200 a month for their services – which is less than my minimum payments. is bankruptcy the answer for struggling moms? Every month you must do paperwork, filling out what money came in and where it went. Which is fairly easy, I kept the same amount for utilities the whole time. But they seem more concerned with money coming in. I had to borrow from my boyfriend to keep my existing bills paid, and wrote that on the printed-out bank statement, ie: borrowed from Len. My mother gave me a check for Xmas, and I had started the bankruptcy in September, so I had to wait till my bankruptcy was cleared, nine months from the beginning, before I could cash it, because all gifts like that become property of the credit company and a form of recovering debt costs. Of course, also in the 9 month period of my bankruptcy, I received a pre-approved credit card in the mail. Another rule – do not apply for any more credit, or your application will be thrown out. I kept it, just in case. And yes, I have used it a little. Will this affect me in the future, I don’t know. I given up on making enough money to qualify to buy a real house. I do own a mobile home, of which, I am grateful. Even though the roof leaks in the winter. When you’re broke, check this post of 3 of the most favorite, easy and cheap meals I made all the time! 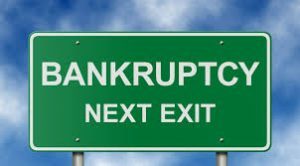 Considering Bankruptcy yourself? Get info on Chapter 7 and 13 here. j.k. rowling, and her welfare-financed billion dollars?